A couple weeks ago I wrote about the discovery of a supernova ten times more powerful than so-called type Ia supernova. This superluminous supernova known as SN2007bi was not only extremely bright, but it remained bright for about five months. Such a long brightness period is indicative of a type of supernova known as a pair instability supernova, so called because the intense gamma rays produced in the core during the explosion form pairs of electrons and positrons (electron pairs). It’s generally thought that SN2007bi is a clear example of a pair instability supernova due to its intensity and long brightness period, but now new supernova observations suggest that SN2007bi wasn’t a pair-instability supernova after all. But if it wasn’t, then how could it remain so bright for so long? In a recent paper in Nature (behind a paywall, but the arxiv version is here), a research team looked at data from two new superluminous supernovae, known as PTF 12dam and PS1-11ap. Both of these were extremely bright and had long brightness periods, just like SN2007bi. But while SN2007bi was only observed once it was close to maximum brightness, the new supernovae were observed as they grew brighter. This is important because pair instability supernovae should not only stay bright for a long time, they should also take a long time to become bright. This is because the debris from a pair-instability supernova is so massive and dense that it takes time (on the order of a year) for the heat and radiation from the explosion to filter through the debris. If you’ve ever cooked with a heavy cast-iron pan as opposed to an aluminum pan, you know that the cast iron pan takes much longer to heat up, but once hot it stays hot for a long time. A pair-instability supernova is similar. It’s so massive that it takes a long time to rise to maximum brightness, and once bright it takes a long time to fade. These two new supernovae did not take a long time to reach maximum brightness. They reached their maximum relatively quickly (about two months). This means they can’t be pair instability supernovae. But they still took a long time to fade, just like SN2007bi. This means our best pair-instability candidate might not have been one after all. But if it wasn’t, then how could it remain so bright for so long? The answer seems to be a magnetic heating effect. When a supernova explodes, the core typically collapses into a neutron star. The magnetic fields of a neutron star can be quite strong, and in their most extreme case the neutron star is often referred to as a magnetar. The intense magnetic field of a magnetar can interact with surrounding material, causing it to superheat. This is similar to a magneto, where a rotating magnet can produce pulses of electric current. Credit: M. Nicholl et al. The authors propose that a large supernova (hypernova) can produce a magnetar when it explodes. Since the hypernova isn’t as massive as a pair-instability supernova, it can brighten fairly quickly. 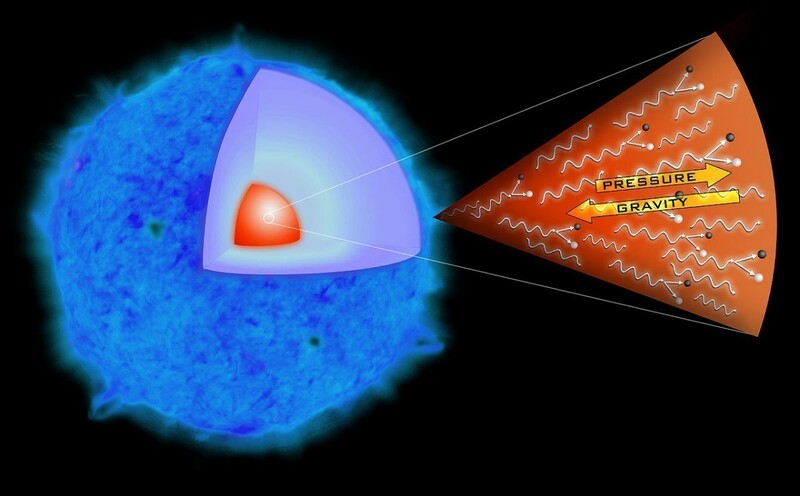 Normally, it would fade more quickly as well, but the intense magnetic field of the magnetar heats the surrounding debris, causing it to remain hot (and therefore bright) for much longer. When the team compared the theoretical brightness curve of a magnetar hypernova with the observed brightness of PTF 12dam, they found it matched really well. You can see this in the figure below (taken from the paper). The black curve shows the theoretical brightness of a magnetar supernova, and the black circles show the observed brightness. The other lines are theoretical pair-instability brightness curves of different masses. Not only does the data match the magnetar theory quite well, it is also clear that a magnetar supernova fades slowly in a way that looks a lot like a pair instability supernova. This means we can’t prove a supernova is a pair-instability one simply by observing it after maximum brightness. We also need to observe its brightening period. Since we didn’t observe the brightening of SN2007bi, we can’t be sure about it. It may have been a pair instability supernova, or it may have been a magnetar supernova. So we’re now not sure whether we’ve observed a pair instability explosion or not, but we now have a better understanding of superluminous supernovae. Sometimes in science you have to take a step back before you can take a step forward.